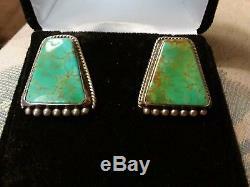 THESE ANTIQUE NAVAJO EARRINGS FEATURE HIGH GRADE CUTS OF ROYSTON TURQUOISE THAT IS BABY BLUE AND GREEN COLORED WITH A SPIDERWEB BROWN MATRIX SET ACROSS THEM. 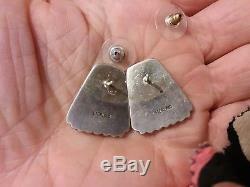 EACH EARRING MEASURES OVER 7/8" BY WELL OVER 3/4". 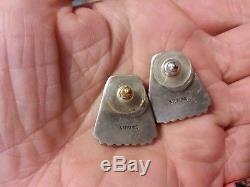 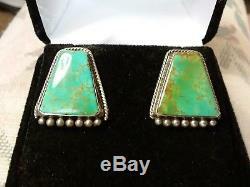 THEY ARE IN EXCELLENT CONDITION AND THEY ARE STAMPED "STERLING" ON THE BACK WITH THE OLD NAVAJO STAMP. 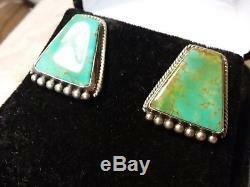 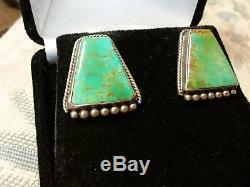 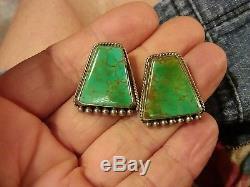 CHECK OUT MY OTHER LISTINGS FOR MORE NAVAJO EARRINGS WITH GREAT TURQUOISE STONES.